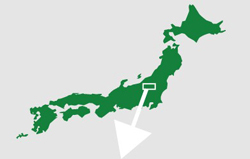 A local railway line stretching around 135 km from Aizu-Wakamatsu Station in the city of Aizu-Wakamatsu in Fukushima Prefecture to Koide Station in the city of Uonuma in Niigata Prefecture is becoming very popular. Many people, Japanese and foreign alike, visit the area to view the railway scenery. As you can see from the attached photos and videos, the reason lies in the line’s spectacular off-the-beaten-track scenery: the refreshing lush greenery of spring, the vivid hues of autumn, and, perhaps even more so, the snowy winter scenes. In 2003 the Tadami Line was voted top of the best 10 local lines in Japan with the prettiest snowy scenery. And the No. 1 Tadami River Bridge along the line in particular is constantly ranked as one of the best three bridges in Japan. 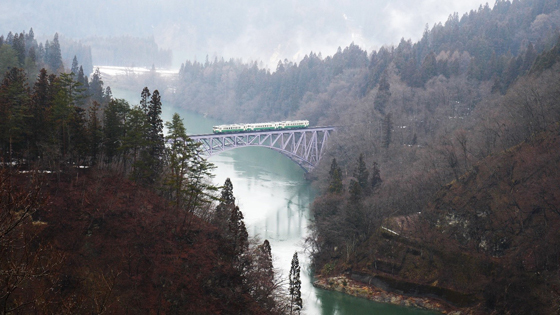 Weibo, China’s largest social network service, apparently introduces the Tadami Line as the “most romantic railway in the world.” The Tadami Line initially opened in 1942, and the full stretch began operating in 1971. At a time when local lines are closing down across the country, the Tadami Line has survived thanks to the strong determination of the related prefectural and municipal governments. I paid a visit to this out-of-the-way railway at the beginning of March, just as winter was coming to an end in the region. Armed with my camera, the first place that I made for was the viewpoint overlooking the No. 1 Tadami River Bridge. The bridge can be seen across a deep gorge. Coupled with the surrounding scenery, it is a magnificent sight. According to a local photographer standing nearby with his camera, “It’s been a warm winter. This year the snow has melted more than three weeks earlier than usual.” I, of course, had been hoping for a little snowy scenery, but this year almost all of the snow had disappeared. Still, the splendid scenery of the environs and the local line trains were much more than enough. There are only six roundtrips a day on the Tadami Line, and daytime photo opportunities from the viewpoint are limited to three up-trains and three down-trains. Two trains each pass over the bridge during the early morning 7 am and 9 am periods, so train spotters have to be on their toes. If you want to take a photo of the trains, you have to keep a constant eye on your watch and the timetable. The chance is here and gone in an instant. The up-train leaving Aizu-Nishikata Station, the one just before the No. 1 Bridge, at 13:03 crossed the bridge a couple of minutes later. Surrounded by dominating mountains, the three-carriage train looked just like a toy. It was much slower than I had expected, and it crossed the bridge with a noisy clanking sound. For a moment, the whole scenery seemed to move.